Mouse anti Porcine macrophages antibody, clone BA4D5 (MCA2317GA) used for the demonstration of macrophages in the subretinal space of pigs by immunofluorescence. Immunolabeling of iPSC-RPE bolus injections in the subretinal space where the GFP-iPSC panels indicate transplanted cells (labeled in green). The merged panels demonstrate presence of accompanying GFP-negative, non-iPSC-derived cells that are positive for macrophage (top panels), CD45 markers (middle panels), and IgG (lowest panels). Corresponding bright field panels are on the far right column. Scale bar = 100 μm. From: Sohn EH, Jiao C, Kaalberg E, Cranston C, Mullins RF, Stone EM, Tucker BA. 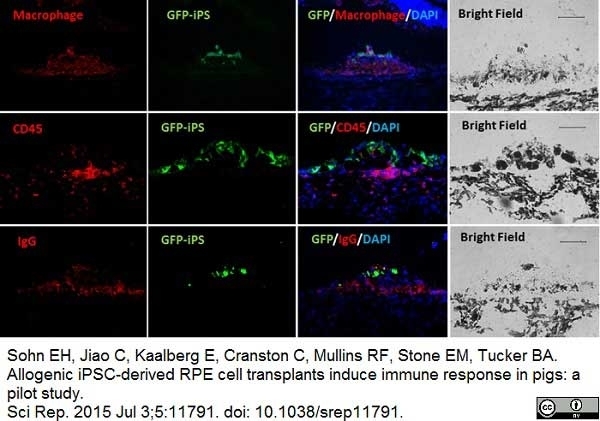 Allogenic iPSC-derived RPE cell transplants induce immune response in pigs: a pilot study. Sci Rep. 2015 Jul 3;5:11791. Mouse anti Pig Macrophages antibody, clone BA4D5 recognizes porcine cells of the monocyte/macrophage lineage. Expression of the antigen is increased with maturation, with higher expression on peritoneal and alveolar macrophages. Some expression has also been observed on peripheral blood lymphocytes. The antigen recognized by clone BA4D5 has a broad tissue distribution and this antibody stains macrophages in a range of tissues, including the thymus, spleen periarteriolar lymphoid sheath (PALS), spleen red pulp and the Peyer’s patches. Expression has also been reported on some non-heamatopoietic cells including endothelial cells. 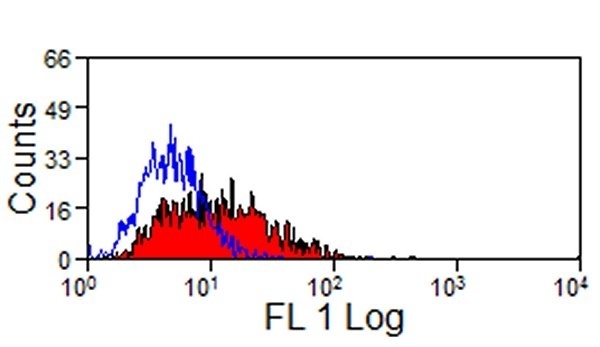 It is believed that clone BA4D5 may be specific for porcine CD68, although the protein recognized by this antibody has not yet been fully characterized. The protein is expressed on the cell surface, although it is most abundantly expressed in the cytoplasm. Spleen cells from immunised BALB/c mice were fused with cells of the mouse SP2/0 mouse myeloma cell line. 2 BA4D5 recognizes a 105kDa antigen in pig macrophage lysates under non-reducing conditions. Use 10ul of the suggested working dilution to 1x106 cells in 100ul. Ezquerra, A. et al. (2009) Porcine myelomonocytic markers and cell populations. Dev Comp Immunol. 33: 284-98. Fujita M et al. (2013) Technique of endoscopic biopsy of islet allografts transplanted into the gastric submucosal space in pigs. Cell Transplant. 22 (12): 2335-44. Liu, G. et al. (2015) Influenza A Virus Panhandle Structure is Directly Involved in RIG-I Activation and IFN Induction. Muscari C et al. (2010) Comparison between Culture Conditions Improving Growth and Differentiation of Blood and Bone Marrow Cells Committed to the Endothelial Cell Lineage. Biol Proced Online. 12 (1): 9023. Dev Comp Immunol. 33 (3): 284-98. Rayat, G.R. et al. (2016) First update of the International Xenotransplantation Association consensus statement on conditions for undertaking clinical trials of porcine islet products in type 1 diabetes - Chapter 3: Porcine islet product manufacturing and release testing criteria. Poulsen, C.B. et al. (2016) Treatment with a human recombinant monoclonal IgG antibody against oxidized LDL in atherosclerosis-prone pigs reduces cathepsin S in coronary lesions. Int J Cardiol. 215: 506-515. Sohn, E.H. et al. (2015) Allogenic iPSC-derived RPE cell transplants induce immune response in pigs: a pilot study. Wang, L. et al. (2017) Porcine alveolar macrophage polarization is involved in inhibition of porcine reproductive and respiratory syndrome virus (PRRSV) replication. J Vet Med Sci. Sep 17 [Epub ahead of print]. Porras, A.M. et al. (2018) Creation of disease-inspired biomaterial environments to mimic pathological events in early calcific aortic valve disease. Proc Natl Acad Sci U S A. 115 (3): E363-E371.